The Magento 2 ecosystem allows creating a multi-vendor marketplace on the basis of our favorite e-commerce platform. You don’t need to look for a custom solution since top vendors already provide extensions with the desired functionality. But what if you want to migrate from an existing website? Below, we shed light on how to import products and customers into a multi-vendor Magento 2 marketplace as well as list solutions designed to achieve the missing functionality. So, if you need to enable the advanced import mechanisms or just think about creating a new online marketplace, you’ve come to the right place. The following article provides all the necessary materials for you to start. 1 What is Multi-Vendor Marketplace? Perhaps, the most obvious example of an online marketplace is eBay. Being an online auction and a shopping website, it gathers multiple sellers that offer all possible goods attracting millions of customers. Thus, a multi-vendor marketplace is a website where numerous individuals, entrepreneurs or companies can sell their products. Each vendor has a micro-store with a connected admin section or just the ability to post products online in the marketplace catalog. Thus, a seller can create a unique offer and in some cases provide its store with own design. The admin section offers the same features as a standard backend interface of Magento. It lets you add products, create categories, manage orders and customers, etc. From the perspective of a marketplace owner, you get total control over all vendors and management processes that take place on their micro-stores. You can edit vendors, orders, transactions, reviews, etc. As a customer, you can browse all micro-stores, add products from different vendors to your cart, and purchase everything in bulk. 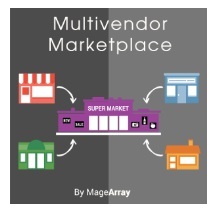 MageArray Multi Vendor Marketplace Magento 2 Extension – is a reliable module that provides you with full control over vendors. You get a convenient dashboard with all the vital stats and the ability to manage all processes that take place in every vendor account. Vendors, in turn, have a powerful interface for running their business. As for customers, they will also be satisfied with the provided experience. Landofcoder Magento 2 Marketplace Pro Extension – this tool provides similar opportunities. As the central administrator, you can manage seller orders, transactions, payments, reviews, etc. Besides, the module lets you choose a seller commission. As for vendors, they can view reports, manage sales and catalog, view reviews and messages, leverage a store locator, and even edit blog articles. As a result, customers get more opportunities that in the case of the above extension. uMarketplace Suite Multi-Vendor Marketplace for Magento 2 by Unirgy is the most powerful and at the same time expensive tool. It offers tons of features as paid add-ons, so get ready to spend lots of money, if you need even a basic multi-vendor marketplace. The solution perfectly suits big businesses. 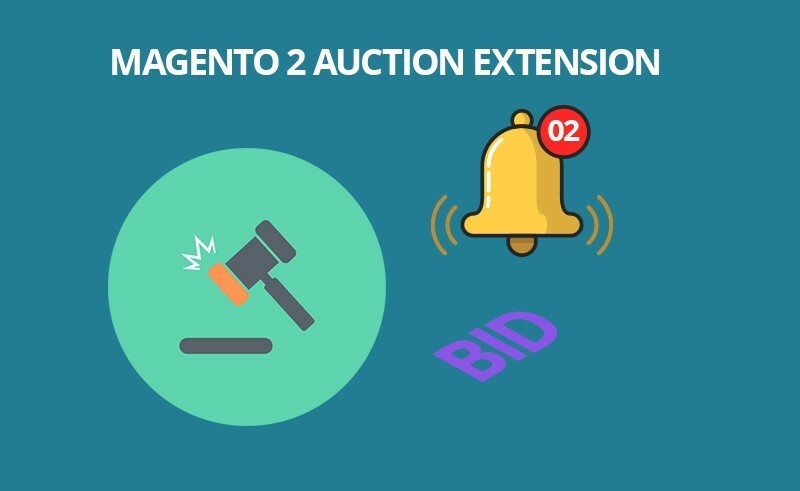 Auction by Landofcoder enables auctions on your Magento 2 store. If you’d like to make your multi-vendor marketplace closer to eBay, it is a must-have extension as well. 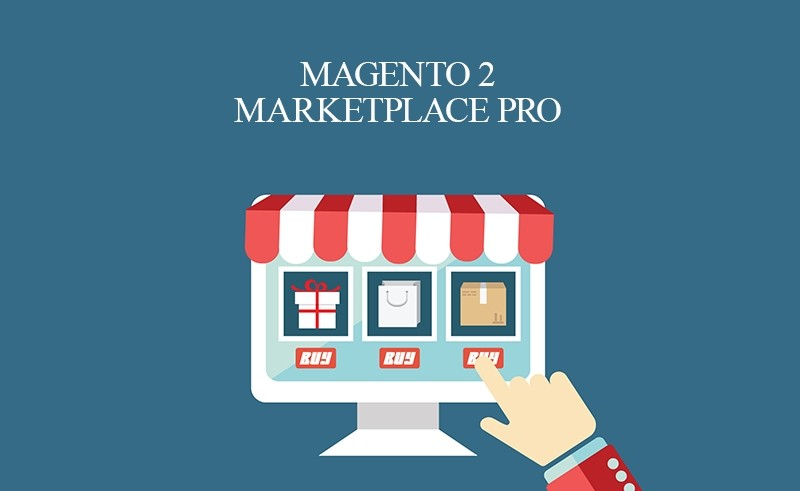 Now, when you know what an online marketplace is and how to create it on the basis of Magento 2, we can return to the main topic of this article. So how to import products and customers to a Magento 2 multi-vendor marketplace? Even though multi-vendor extensions offer built-in import functionality, we recommend you to rely on a third-party solution since native features are usually weak and require lots of manual work to be done. For instance, you have to add product images manually or edit data files before the import procedure. Go to the admin section of the extension, find its import part, and create a new job there. As you can see, products and customers can be imported into your Magento 2 multi-vendor marketplace within just a few clicks. Let’s take a look at the extension’s functionality in more detail. Import vendor-specific attributes and their unique values. And this is only the tip of the iceberg. If you need any custom import functionality, you can ask us to implement it. The Firebear team always wants to make our core product better so that we are highly responsive to the demands of our clients. The improved Import & Export Magento 2 extension offers two ways to automate import processes related to your multi-vendor marketplace. First of all, you can create schedules. Also, we provide an opportunity to launch import automatically after a specific event. Let’s describe each feature individually. The Improved Import & Export extension supports cron allowing you to create any update schedule for your Magento 2 multi-vendor marketplace import processes. Use the standard cron syntax to specify the update period. If you don’t know how to use it, select one of the predefined intervals. Note that they can be freely customized if necessary. If the import of products and customers into your Magento 2 marketplace is a one-time procedure, you can create an import profile without a schedule. Configure it, start a process, and delete or leave for further data transfers. It is also necessary to mention that you can launch scheduled jobs asynchronously. Thus, every update will be transferred into the system on time. In addition to cron, our module supports Magento 2 events and observers. Thus, a data transfer into you multi-vendor marketplace can be launched when specific conditions are met. Just choose a system or custom event that will trigger the update. For further information, read this article: How to Run Magento 2 Import or Export After Specific System Event or Process. It is not a secret that Magento 2 has lots of limitations. Of course, it is much more potent than its predecessor, but there is still room for improvement. And while the core development team is working on them, we already provide what the community requests. For instance, Magento works with CSV files only. While most third-party import and export solutions offer XML support just, we dramatically extend this list by introducing the ability to import and export data via XML, JSON, ODS, and Excel. You no longer need to convert this files to CSV and vice versa to establish the connection between your e-commerce store and a remote system. What about the Magento 2 multi-vendor marketplace data import? All these standards are supported as well! Furthermore, the Improved Import & Export Magento 2 extension offers different opportunities regarding file sources. It means that you have several options for transferring data files. Firstly, our module provides extensive support for FTP/SFTP. It leads to two options. You can use either a local or remote server for file transfers. Secondly, the Improved Import & Export works with Dropbox allowing you to leverage your account in the cloud to import/export data files. Thirdly, you can import products and customers into a Magento 2 multi-vendor marketplace right via a direct URL. It is also worth mentioning that all compressed data is unzipped/untarred automatically. 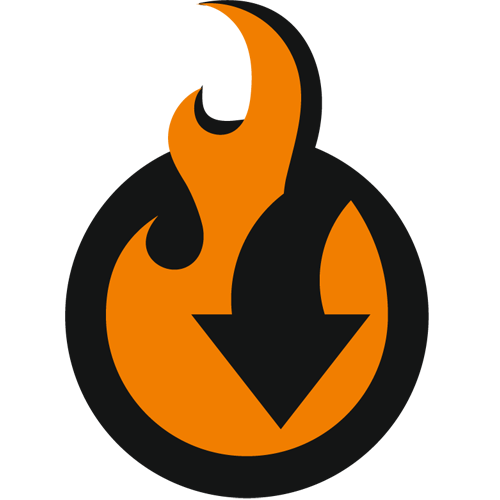 Thus, you can import file archives without extracting their content. Alternatively, you can create a direct connection with an external platform via REST API, SOAP API, or GraphQL API. Note that all the extension features work equally well with file transfers and direct connections. Another vital problem that is not solved in Magento is the necessity to edit data files before every import. You should match external attributes to ones used internally manually. And this procedure is far from being a user-friendly one. The more data files you have, the more work should be done. And it is necessary to repeat the procedure every time new update files are provided. However, we offer the automation of this processes. The Improved Import & Export Magento 2 extension provides the ability to apply mapping presets or create matching schemes in a convenient interface. Let’s take a look at each feature individually. Note that the created mapping scheme is saved and applied for all further data transfers so that you don’t need to repeat the process anymore. To simplify data import into a Magento 2 multi-vendor marketplace, we also offer the following mapping features and attribute-related enhancements. First of all, it is the ability to map attribute values. Just like the standard attribute mapping, this feature helps to save tons of time. You no longer need to import unnecessary attribute values – instead, the Improved Import & Export Magento 2 extension lets you map them to ones used internally. The procedure is based on the same principle as the attribute matching described above. It takes place in the same environment, and you can match multiple external values to a single one. More information regarding attribute values mapping is available here: Attribute Values Mapping. Attribute values editing is another feature that enables you to manage attribute values more efficiently. This time-saver allows using multiple rules and conditions to apply changes in bulk. The Improved Import & Export Magento 2 extension provides the ability to add a prefix, suffix, or both. And it is possible to merge or split the data as well. The corresponding features are described here: How to Modify Attribute Values During Import and Export in Magento 2. Another feature we’d like to draw your attention to is the ability to map categories. It should be handy when you import products into a Magento 2 multi-vendor marketplace. The corresponding extension interface lets you match all external designations to ones used in your database without affecting the existing catalog. At the same time, you can create new categories right during the import process. For further information, follow this link: Category Mapping. And you can freely create attributes on the fly. If any data is absent in the import file, the Improved Import & Export Magento 2 extension allows specifying parameters necessary to create the missing attributes. Next, the module does all the dirty work for you. Follow this link to discover the full algorithm of attributes creation on the fly: Product attributes import. As you can see, importing products and customers into a Magento 2 multi-vendor marketplace is not a problem at all. With the Improved Import & Export Magento 2 extension, you can fully automate this process. Furthermore, the module can be easily connected to all existing marketplace extensions providing you with seamless integration. If you have any questions, follow the link below and contact our support.